Woody plants of the Proteaceae family are a symbol of fynbos. Of the approximately 360 southern African species, over 330 are restricted to the Fynbos biome1 and form an important part of this biome's exceptional plant diversity.2 Proteaceae dominate the overstorey of fynbos vegetation, play a key role for water, carbon and nutrient cycling, and provide resources for many species of pollinators and herbivores.1,3 Moreover, Proteaceae are responsible for the bulk of the economic value generated by the fynbos wildflower industry4 and serve as flagship species for conservation. The key role of Proteaceae for the functioning, conservation and economic use of fynbos has led scientists, conservation managers and volunteers to collect a wealth of information on the geographical distribution, ecology and evolutionary history of this group. The foundation for this knowledge was laid by intense research on the population biology of Proteaceae conducted in the 1980s.3,5 This research concentrated on 'serotinous' species (36% of fynbos Proteaceae, including most overstorey species, Figure 1a) that store their seeds in fire-safe woody cones and therefore form 'canopy seed banks' but no persistent soil seed banks. Fire triggers the release of seeds from the cones, limiting dispersal and seedling establishment to a short period post-fire. Moreover, 86% of fynbos Proteaceae are 'nonsprouters' (Figure 1b), meaning that fire kills adult plants. In serotinous and nonsprouting Proteaceae, long-term birth, death and population growth rates can be quantified much more easily than for most other plants. Consequently, this group is ideal for studying basic ecological and evolutionary questions. The excellent quantitative understanding of their demography has direct implications for conservation: CapeNature and SANParks use serotinous nonsprouting Proteaceae as indicators to assess the impacts of fire on fynbos biodiversity. The publications resulting from the Fynbos Biome Project (a National Programme for Ecosystem Research initiated in 1977 by the Council for Scientific and Industrial Research) led to the number of publications on fynbos Proteaceae peaking in 1991 (Figure 2). 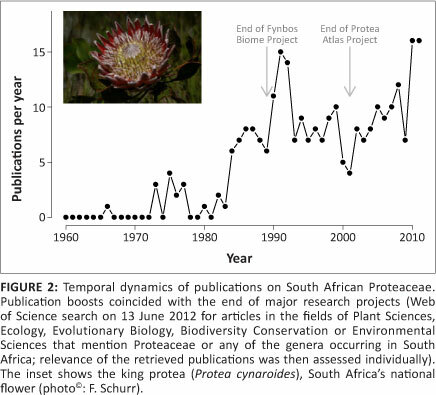 Since then, interest in Proteaceae has been revived by the Protea Atlas Project, resulting in a second peak in publications on this family in 2010-2011 (Figure 2; in both cases note the long lag times). This remarkable citizen science project involved more than one thousand volunteers assembling about 250 000 estimates of the local abundance of Proteaceae species. This data set paints a detailed picture of the geographical ranges and abundance variation of the fynbos Proteaceae. The Protea Atlas Database has thus been termed 'the largest and highest quality of its kind in the world for studying biodiversity'6. It played a crucial role in the development of species distribution models,7,8,9 which relate data on species' geographical distributions to environmental variables and have become the predominant method for climate change biodiversity assessments.10 The database also served as an important source of information for systematic conservation planning.11 Recently, this demographic and biogeographical knowledge has been complemented by molecular data which elucidate the evolutionary processes that created the extraordinary interspecific and intraspecific diversity of Proteaceae.12,13,14 As a result of this comprehensive ecological, biogeographical and evolutionary knowledge, the fynbos Proteaceae are now recognised worldwide as model organisms for biodiversity research and conservation. Recent work building on this exceptional knowledge was presented at this year's Fynbos Forum held from 16 July to 19 July 2012 at Cape St. Francis (South Africa). Researchers, managers, landowners and other stakeholders convened for the special symposium 'Proteaceae: research and management priorities in a changing world'. Presentations at the meeting followed three general themes: the demography of Proteaceae under environmental change; drivers of the group's extraordinary diversity; and interactions between Proteaceae and other organisms. Proteaceae demography has drawn renewed interest because of the need to understand the dynamics of species and communities under global change. Desika Moodley (Stellenbosch University) measured cone production and seedling recruitment in different populations of Hakea salicifolia to understand under which conditions this Australian proteoid becomes naturalised in fynbos. With the aim of informing improved forecasts of native Proteaceae range dynamics in response to changes in climate, land use and fire,15-16 John Silander (University of Connecticut, USA), Frank Schurr and Jörn Pagel (Universities of Montpellier, France and Potsdam, Germany) presented studies of large-scale variation in growth, reproduction and mortality across the geographical ranges of several species. Anthony Rebelo (South African National Biodiversity Institute) presented experimental tests of climate change impacts on the germination and seedling emergence of several Proteaceae species. Germination was reduced at higher temperatures, but some seeds still germinated at temperatures 3.5 °C higher than at present. Seedlings differed strongly in their tolerance of extended drought although the causes are poorly understood.17 While climate change effects on Proteaceae demography are still under-researched, certain populations appear threatened by increases in fire frequency observed in much of the Fynbos biome.18 Three demographic studies performed by Annelise Schutte-Vlok (CapeNature), Tineke Kraaij (SANParks) and Katharina Mayer (Potsdam, Germany), independently concluded that contemporary fire intervals are frequently too short for slow-maturing nonsprouting species to set seed. Small-scale demographic variation is also the focus of ongoing research presented by Henning Nottebrock (Potsdam, Germany) and Baptiste Schmid (Biodiversity and Climate Research Centre, Germany). They mapped all shrub individuals in 27 Profea-dominated communities at high spatial resolution, quantifying how plant traits determine the strength and spatial scale of plant-plant and plant-pollinator interactions and how these interactions affect the reproduction of individual plants. Potentially, such trait-based demographic studies will not only improve our understanding of existing communities, but will also help to predict the dynamics of novel communities that will arise when global change reshuffles the geographical distribution of species.19 Proteaceae are well suited for such trait-based studies as they show remarkable variation in plant size, leaf form, ability to survive fires and many other functional traits. This variation is the reason Linnaeus named the family after the Greek god Proteus, who could take any shape. A third line of research examined pollination, seed dispersal and seed predation interactions. Sandy-Lynn Steenhuisen (University of Cape Town) showed that rodent-pollinated Protea species evolved repeatedly from bird-pollinated ancestors and that these pollinator shifts are associated with the appearance of sour-milk floral scents. Such pollinator shifts can even occur within species: Christopher Johnson (Stellenbosch University) showed that the common form of Leucospermum tottum can be pollinated by both birds and insects, whereas a narrowly distributed variety relies on birds. Using experiments and pollinator observations in mapped communities, Baptiste Schmid quantified how strongly plants depend on bird pollination and compete for bird visits. Anina Heystek (Stellenbosch University) suggested that pollinator-mediated competition even shapes large-scale plant distributions: analysing Protea Atlas data, she showed that Proteaceae with the same pollination syndrome co-occur less frequently than expected by chance. Finally, Ursina Rusch (Stellenbosch University) studied rodents which cache and eat nut-like Proteaceae seeds, thereby acting as both seed disperser and seed predator. The Cape spiny mouse (Acomys subspinosus) caches single seeds, thereby hiding them from the seed-predating striped mouse (Rhabdomys pumilio) which poorly detects single seeds. The scientific presentations were followed by a workshop attended by 37 people from a range of research and management backgrounds. When asked: 'What are the most important questions from a management perspective? ', participants primarily mentioned the topics fire (38%), conservation planning (23%), indicators and monitoring (13%) and climate change (12%). Researchers tended to ask questions which were basic in nature (64% basic vs 36% applied, N = 22) whilst the opposite was true for managers (28% basic vs 72% applied, N = 15). So even within the bounds of the set question, researchers and managers framed questions for applied research differently. This difference emphasises the importance of encouraging opportunities for researchers and managers to develop research priorities in collaboration. Yet it was encouraging that ongoing research initiatives aim to address many of the applied questions asked. For example, to assess biodiversity impacts of fire management, wild flower harvesting and habitat fragmentation, one needs demographic knowledge (such as how reproduction and mortality depend on fire intervals, which populations are seed-limited and how long isolated populations can persist). 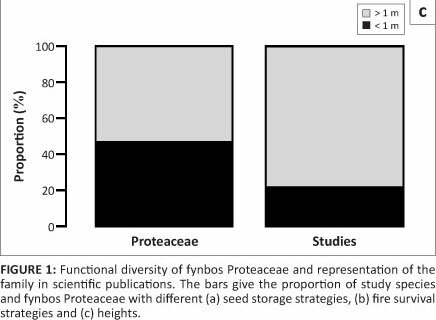 It could be argued that fynbos research has focused too strongly on the Proteaceae, neglecting most of the biome's plant diversity. 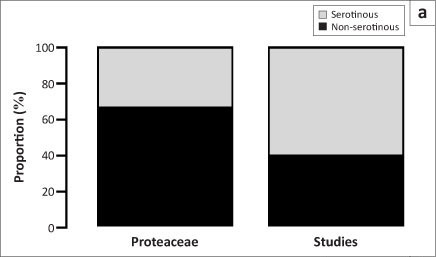 Even within the Proteaceae, non-serotinous and small-statured species are understudied (Figures 1b and 1c), and the full research potential provided by the functional variation of this iconic group is yet to be realised. 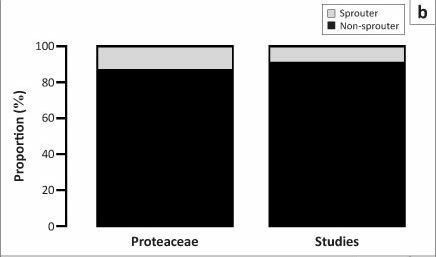 Nevertheless, concentrating on a single taxon enables the quantification of regional variation and should yield nuanced insights for conservation across the biome. Although broadening the scope to provide better coverage of other fynbos families will be invaluable, we expect that Proteaceae will continue to play a central role for biodiversity research in the fynbos and beyond. The special symposium and workshop on Proteaceae were held in celebration of the German-South African Year of Science, and were funded by a grant of the German Federal Ministry of Education and Research, the South African Department of Science and Technology and the National Research Foundation to K.J.E., N.A. and F.M.S. Additionally, F.M.S. acknowledges support from the German Research Foundation (SCHU 2259/3-1 and SCHU 2259/5-1). Kent Holsinger, Tineke Kraaij, Byron Lamont, Jörn Pagel and the rest of the workshop participants are thanked for their valuable inputs.